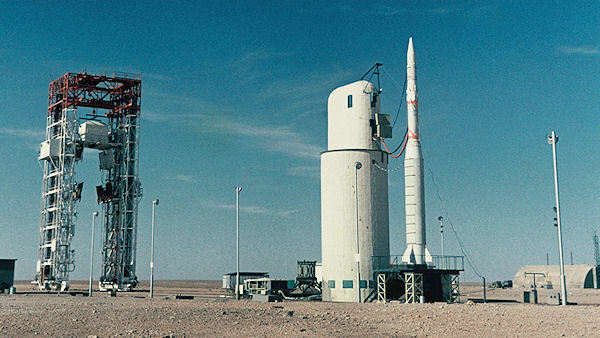 The Diamant rocket was launched from the French missile test site at Hammaguir in Algeria. The launch complex for the rocket was called "Brigitte" and is probably located at 30°46'39.31"N.3° 3'10.58"W. Unfortunately Google Earth only provides a low resolution image of this site which is located to the south-west of the headquarters of the launch site. Hammaguir was abandoned by France in 1967 as part of an agreement with the then newly independent Algeria. Launches of the Diamant were moved to Kourou, French Guyana. The first stage was 10 meters high had a diameter of 1.4 m and weighed 14.7 metric tons. The Vexin liquid-propellant engine (nitric acid) provided a thrust of 269 kN for 93 seconds. The solid-propellant second stage was 4.7 m long with a diamater of 0.80 meters. It weighed 2.9 metric tons and provided a thrust of 165 kN during 44 seconds. The solid-propellant third stage was 1.85 m long with a 0.65 m diameter and weighed 709 kg. It burned for 45 seconds with a thrust of 27-53 kN. The entire Diamant-A rocket was 18.95 m tall and had a lift-off mass of 18400 kg. The equipment section in the third stage contained an attitude control system with small nozzles that pointed the second stage in a horizontal attitude and then spun it up in preparation for the ignition of the third stage. Freon was used as a propellant for these nozzles. 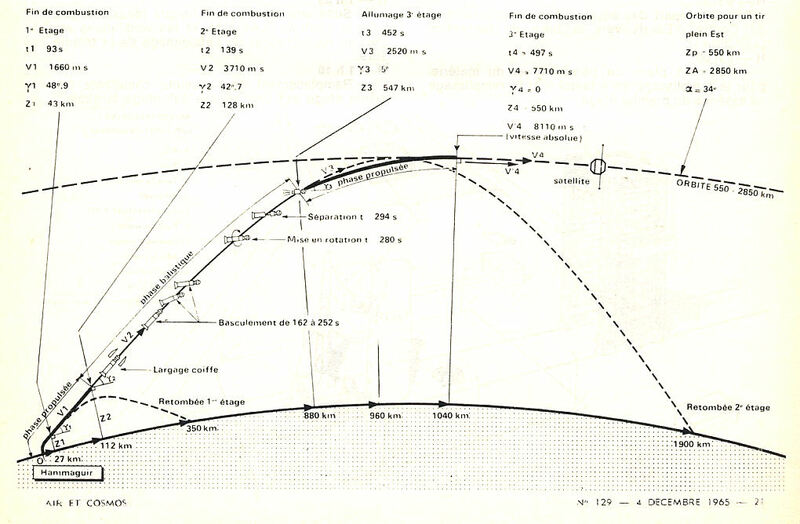 The graphic below showing the details of the ascent to orbit for Diamant is available on the Internet. I have tried to improve it somewhat. Its source is the French aerospace magazine Air et Cosmos for 4 December 1965. It provides a lot of interesting data - like the impact ranges for the first and second stages. The last Diamant launch from Hammaguir was seemingly also the final operational activity at the site. The ground track of the first two launches were almost identical. 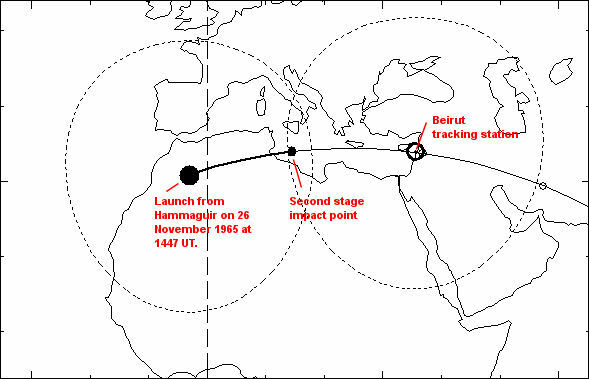 The figure below shows the ground track for the first launch. Interestingly, the second stage dropped into the Mediterranean off the Tunisian coast. CNES had also established a ground station in Beirut which was directly under the ground track. For the two following launches, that aimed for 40° inclination, it was impossible to reduce the launch azimuth (i.e. to fly along a more northern track) because that would have meant dropping the second stage very close to Sicily. Therefore a southeastern flight path was chosen. The second stage dropped into the Sahara - in the northern part of Niger. This country became independent from France in 1960. Back to Space History Notes.